At Sun Oaks we want to promote wellness and health in as many aspects of your life as possible. That’s why we use whole, raw fruits and berries instead of concentrates or syrups and provide you with milk options other than dairy. We developed smoothie recipes we think are deliciously perfect but you’re always welcome to adjust them to your dietary needs. 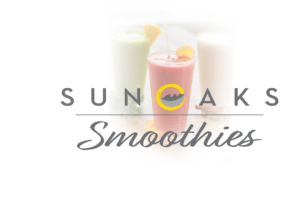 Smoothie orders can be placed for immediate consumption or before your workout to have it ready for you on your way out. Check the board in the lobby for the new flavor! We know you’re on the go and how difficult it can be to always get the nutrients you need in your day. We’re here to help with everything from workout recovery, meal replacements, or just a daily dose of vitamins to help you reach your optimal health goals. Choose from our several add ins to aid in you daily wellness.